My husband and I recently went to a holiday gathering and the host created a small menu card that was placed on an easel and set on the bar. The cocktail menu card listed 3 of their best martini recipes with all the ingredients shown so the guests could pick the one they wanted and the bartender could quickly mix it for them. That little menu card is the best idea! How many times do you get to a bar or party and not really know what you want to drink? It happens to me all the time. When the bartender comes over and asks for my order, I pause and ponder and think until something comes to mind and then I order. What a waste of time. I love restaurants and bars that offer a drink menu because I like to try new things and having a list of the establishment's best martini recipes and cocktails helps me make a decision and saves the bartender time. So when you are hosting your own theme event, especially holiday parties, why not offer a cocktail menu? Pick out a few of your best holiday martini recipes and type them up on a card. Laminate it if you have time and set it out on your bar. 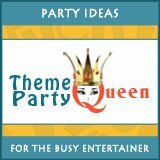 A year ago, I created a menu for my own personal use and now I am making it available to Theme Party Queen visitors. Click here to learn more about our free Cocktail Ideas Menu. It has 12 of our best martini recipes and 8 cocktails. Mine is laminated and sits in an easel on my bar. If you don't have a person you can designate as a bartender for the evening, just mix up 3 pitchers full of your best martini recipes or cocktails, place a menu card on the bar near the pitchers and you will be ready to serve as your guests arrive. They will be able to quickly look at the cocktail menu card, know what is in each pitcher and make a decision. An added benefit of offering only a few of your best martini recipes and cocktails on a menu card is that guests can get their own refills when the party really gets going. Here are a few of our favorite recipes for a holiday martini. Anything pomegranate seems to be popular these days so this pomegranate martini recipe is a perfect holiday martini to offer your guests. Love this with the citrus vodka. So much better than with regular vodka. In a cocktail shaker combine simple syrup, vodka and pomegranate juice with plenty of ice. Cover and shake. 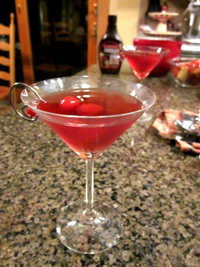 Strain into a martini glass and garnish cherries. Makes one Pomegranate cocktail, a perfect holiday martini. NOTE: You can buy bottled simple syrup but can also make your own simple syrup easily enough. It's just equal parts of sugar and water simmered until sugar dissolves then refrigerated. Find more recipes for pomegranate martinis here. Mix ingredients with ice in a martini shaker and pour into glasses. Garnish with pineapple wedge. Makes the best bleu martini cocktail! If you like cocktails with pineapple juice, you may also like this Pineapple Martini Recipe found on our Easy Martini Recipes page. It was about a week before my 22nd wedding anniversary that I saw a Rachael Ray travel episode that was filmed in Chicago near where I live. In the episode she talked about going to the top of the John Hancock building to "The Signature Room", one of Chicago's elite restaurants, and enjoying a Sidecar Cocktail. My husband and I were planning a weekend celebration so we decided to take Rachael's advice. I ordered a Sidecar cocktail at The Signature Room (what a view!!! ); and absolutely loved it. With only 3 ingredients, it is easy to make and perfect for a holiday dinner party. Mix together in a martini shaker with ice until well chilled. Do not substitute bottled lemon juice. Garnish with a twist of lemon peel. Easy, right? Like brandy? 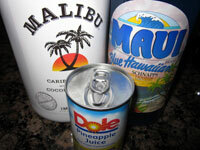 How about this recipe for Fruited Brandy Punch. Not really a fan of a Dirty Vodka Martini myself but many people rave about them including some of my friends. I tend to go with the fruitier type of martini like the others on this page, but here is the recipe anyway. It is good to have in your arsenal should your guests request one. 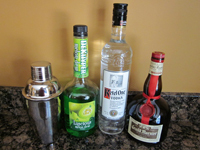 To make a dirty martini, mix ingredients in a shaker with ice, pour and garnish. The 'Dirty' in the name comes from the olive juice. This recipe makes one Dirty Vodka Martini. Not just for ladies anymore. This Apple Martini Recipe is loved by guys too! 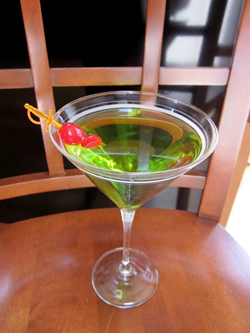 If you like Apple Pucker, try the recipe on this page for an Irish Pucker Martini. This Honeydew Martini Recipe has become very popular especially at summer gatherings. It is not only beautiful to look at but it tastes crisp and cool on a hot summer day. Pour the vodka, melon liqueur and Grand Marnier into a cocktail shaker half-filled with cracked ice. Shake well, and strain into a chilled martini glass. Garnish with cherries. You might like this recipe for a Pear Vodka Martini which is also made with Melon liqueur. 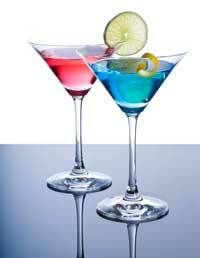 Below you will find more holiday martini recipes for you to try. And check out our specially selected martini glassware while you are here. It is handcrafted by artisans all over the world and sold by one of our partner sites, Novica.com. There stuff is just beautiful, truly one-of-a-kind glassware.